This was the third consecutive monthly gain that has been well above modest gains earlier in the year. While at least one major jewelry chain has reported disappointing holiday sales, our reports from independent jewelry merchants indicate that many posted solid gains. 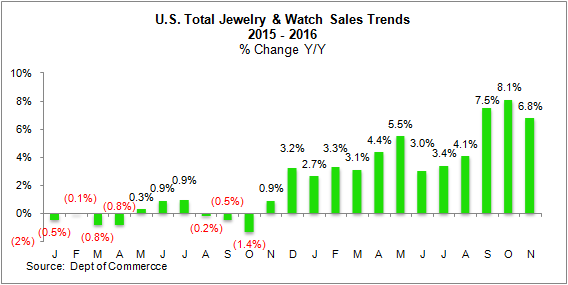 It will be at least two or three months before we have reliable and credible data on 2016 holiday sales but, in general, we feel good about the sales results for most jewelers.